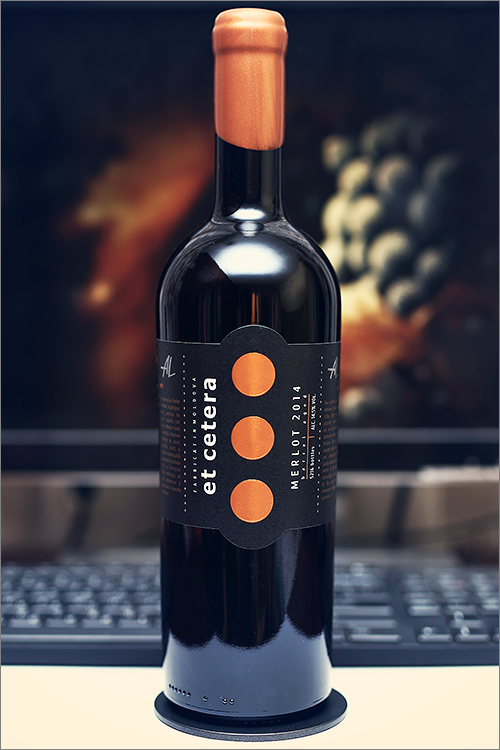 Tonight we are going to review a legendary single varietal merlot wine from the flagship line of winemaker’s premium wines also known as ‘black label’ – Merlot 2014 by Et Cetera. This is the successor of the famous Merlot 2012 wine and, as is the norm for this class of wines, it has been produced in a limited edition of only 5216 bottles and aged for 18 months in new oak barrels. Merlot is usually regarded as the underdog to cabernet sauvignon, but make no mistake here – merlot is first class, and on that note let’s get rid of the theory and move on straight to the tasting! Noble garnet color, not too deep yet quite opaque, with pale copper shades towards the rim of the glass. The nose is strong, filled mostly with black fruit and spice flavours: black cherry, blackcurrant, blackberry, sour cherry, overripe black plum, black mulberry, ripe marionberry and leather. An instant later the nose is filled with elegante notes of red pepper, nutmeg, black pepper, roasted oakwood, sweet tobacco, black tea and some subtle hints of sun-dried cherry tree wood. The wine is dry, with high alcohol level, high acidity and ripe tannin. It feels lean, supple and complex, with a quite dense and bold body. This is a well structured, ripe and seedy-crisp wine, as it tastes firm and maybe just a bit opulent and lush. The wine feels very balanced, with a quite fine tannic grip on the mouthfeel, with a dominant fruity accent. It has a medium-plus finish and an balanced, tart and seedy aftertaste. This is definitely a fine Wine of Moldova and the overall rating says the same, with 91.0 points scored it is right there, among the best wines we’ve tasted so far. Please click on the chart icon on the left in order to get to the wine rating page, where you can find all the wines we’ve tasted to date. Conclusion: this is a wine that is almost in its top form, just a couple of months off its prime, therefore we would recommend some bottle ageing for about 6 to 12 months. Despite its youthfulness, the wine has a fine and ripe tannic grip on the mouthfeel, which leads to a full-bodied palate, firming beautifully on the finish, where the nuanced fruity flavors glide alongside those subtle woody notes and gain traction. In order to amplify its aromatics we would recommend to pair this wine with meaty dishes rich in bloody-umami flavours and smooth textures, like for example a very-rare filet mignon steak with red wine reduction sauce, just remember to keep the filet mignon steak rare, so that it will counter-balance all the sharp edgest of the wine and will enrich its texture. Enjoy!